Luxury Indulgence Has Won BEST FOOD! You are here:Home » Awards » Luxury Indulgence Has Won BEST FOOD! Once again, thank you readers for your support & votes. 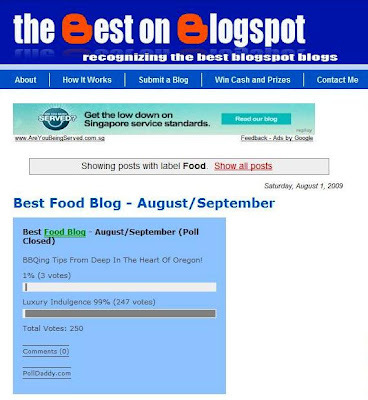 Luxury Indulgence has emerged as finalist & won 'Best Food Blog'. Keep your comments coming & thank you for your wonderful support! Congrats & keep your recipes coming! Wow! Wow! Wow! Yet another award. Sure you have enough space for putting up all your awards? Haha! Congratulations again!